Betty Smith's A Tree Grows in Brooklyn is a pretty conventional coming of age story, larded with more than its share of sentimentality ... at least from a remove of the 70 years that have passed since it was published. I read the novel for the first time this month. The book is clumsily written by the standards of this day and age: the passive voice had me cringing every third page or so, and the oddly-abstracted omniscient narrator didn't put much of a brake on abrupt mid-scene switches from one character's point-of-view to another's. As much as any other beloved book in the canon, A Tree Grows in Brooklyn illustrates the limits of plot description. In its nearly five hundred pages, nothing much happens. Of course that's not really accurate: Everything that can happen in life happens, from birth and death to marriage and bigamy. But those things happen in the slow, sure, meandering way that they happen in the slow, sure, meandering river of real existence, not as the clanking "and then" that lends itself easily to event synopsis. 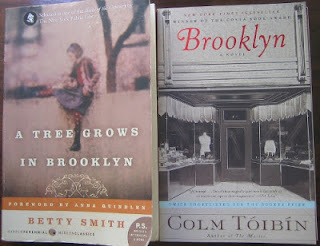 [...] A Tree Grows in Brooklyn is not the sort of book that can be reduced to its plot line. [...]. All that said, you'd have to be something of a beast not to fall for Smith's protagonist. Francie Nolan is toughened by her family's hardscrabble life, but a proudly controlled exterior learned from her clear-eyed mother conceals a little girl as tender as any other in pre-war Brooklyn (that'd be WWI, the war to end all wars). The writing's on the wall early on that Francie's gentle but haplessly alcoholic father isn't long for the world; and that a kind, honorable, decently-salaried neighborhood cop -- who is himself caring for a sickly wife -- will step up to marry Francie's mother when the time comes for each of their lives to enter a new chapter. But the foreshadowing doesn't diminish Smith's story. 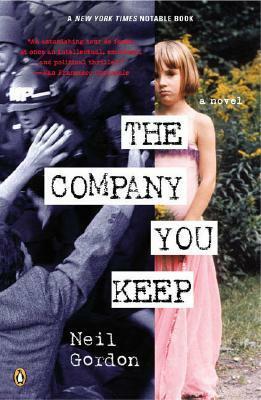 Francie is so real, so sharply observant, so simply loyal to her family -- and the Nolans live so close to the corner of homeless and hungry -- that a reader can't help but be drawn into the uncertainty of Francie's fate as she herself experiences it in the tumultuous now of an impoverished childhood. Colm Tóibín's Brooklyn, which unfolds in the years immediately following WWII, has a little more plot to it. Poverty in rural Ireland leads a passive young woman to emigrate to the U.S., but only because her sharper-witted older sister insists it's the thing to do. Eilis Lacey bucks a convention or three, refusing to buy into the gossipy small-mindedness of her fellow boarding house residents, but throughout the novel she just ... falls into the events of her life. Eilis's destiny is what chance and other people plot for her. Tóibín's protagonist is no Francie Nolan. Even the novel's climax turns on the power of long-distance gossip to force a decision Eilis seems powerless to make for herself. But the Lacey women cannot speak plainly to one another. "They could do everything," Toibin writes, "except say out loud what it was they were thinking." And so, too young to understand the consequences of her reticence, too obedient to bolt at the dock, too humble to imagine that her own life is her own business, Eilis boards the liner for America, an irrevocable step that her mother, her sister and Eilis herself might never have wished her to make had they thought it through. America is peopled, for the most part, by the descendants of immigrants who had the resolve, the daring and the detachment to leave behind the places and people they had formerly known. But Eilis isn't such a person; detachment isn't part of her makeup. It has been thrust on her by women who are as attached to home and family as she is. What were they thinking? They wouldn't, or couldn't, say. Tóibín writes with a clarity that causes the author to all but disappear from his story. You might like that, you might not, but you can't really doubt that this writer is in control of his language. More so by leagues than Betty Smith, even accounting for the decades that separate publication of these novels. Yet for me, clarity and control weren't enough. Eilis Lacey's story left me cold, even before I had Francie Nolan's portrayal for comparison. 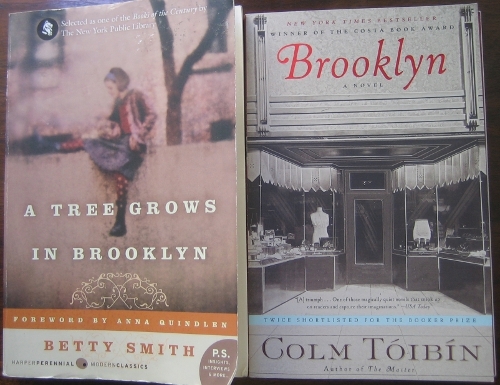 A Tree Grows in Brooklyn is burdened by Betty Smith's flacid prose, by sentimentality, by an editor whose red ink seems to have run out part way into the job ... but in the end it doesn't matter much because readers have, for decades, longed to identify with Francie Nolan, whether she's shaming an arrogant doctor into treating her kid brother with humanity and respect; or facing down a simpering, saccharine English teacher who mistakes blindered convention for truth and beauty; or making the best of a heart callously broken by a selfish young man on his way off to war. Who wouldn't want to be this plucky, faulted, tenacious heroine? Just this past Friday, an Op-Ed appeared in the NY Times by Daniel L. Squadron (a New York state senator who represent parts of Brooklyn and Manhattan), titled Can a tree Grow in the Bronx?. It's about taking care of the many city parks that aren't the "marquee jewels in the system." Friday was the same day I finished reading A Tree Grows in Brooklyn, some 70 years after the novel's release. Some books really stick. And they're not always the books that are pristine in their execution. Go figure. I snapped the photo of Brooklyn across the East River, above, in 2011, on the hottest June 8th since 1933. 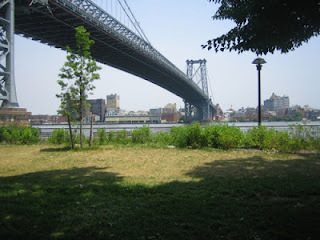 I was standing (in the shade) where East River Park meets the Manhattan side of the Williamsburg Bridge. The image first appeared on this blog in the post Heat wave in New York. Does driving less mean living in the cloud(s)? People tend to drive less during recessions, since fewer people are working (and commuting), and most are looking for ways to save money. 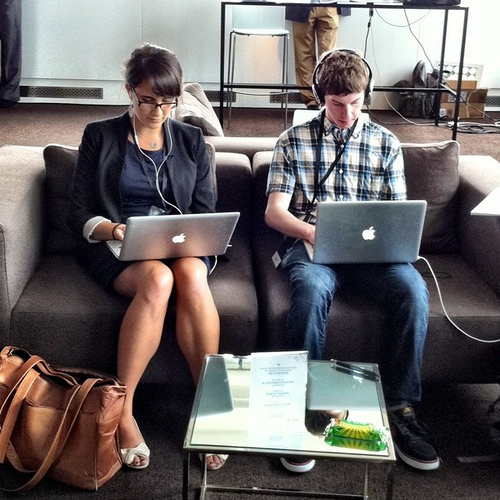 But Phineas Baxandall, an author of the report and senior analyst for U.S. Pirg, said the changes preceded the recent recession and appeared to be part of a structural shift that is largely rooted in changing demographics, especially the rise of so-called millennials — today's teenagers and twentysomethings. 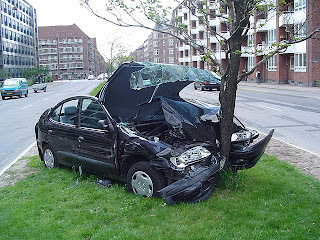 "Millennials aren't driving cars," he said. Americans drove more miles nearly every year between the end of World War II and 2004. [...] By the end of this period of rapid increases in per-capita driving -- which we call the "Driving Boom" -- the average American was driving 85 percent more miles each year than in 1970. A return to the steady growth in per-capita driving that characterized the Driving Boom years is unlikely given the aging of the Baby Boom generation, the projected continuation of high gas prices, anticipated reductions in the percentage of Americans in the labor force, and the peaking of demand for vehicles and driver's licenses and the amount of time Americans are willing to spend in travel. Sobering stuff: "anticipated reductions in the percentage of Americans in the labor force." Online life might have something to do with the change, [Sivak] suggested. "A higher proportion of Internet users was associated with a lower licensure rate," he wrote in a recent study. "This finding is consistent with the hypothesis that access to virtual contact reduces the need for actual contact among young people." 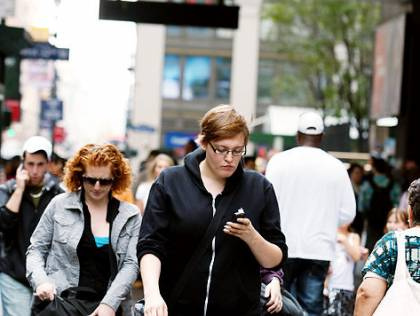 Millennials are more likely to want to live in urban and walkable neighborhoods and are more open to non-driving forms of transportation than older Americans. They are also the first generation to fully embrace mobile Internet-connected technologies, which are rapidly spawning new transportation options and shifting the way young Americans relate to one another, creating new avenues for living connected, vibrant lives that are less reliant on driving. Urban and walkable neighborhoods? I'm all for that. I'm not a millennial by any stretch of the calendar, but I live and work in an urban and walkable city myself ... and I'd readily say that ability to get where I need to go without having to drive much at all is a top contributor to my day-to-day satisfaction. But ... that business about mobile Internet-connected technologies: does that mean that if I'm strolling around my urban and walkable neighborhood, and you're strolling around yours, that we needn't actually meet face-to-face because the "vibrant lives" one can construct via Twitter, Skype, Tumblr and Facebook make actual social interaction superfluous? Coincidentally I half-heard a radio advertisement yesterday for some ATT internet service or other. I didn't transcribe the commercial, but the setup had a couple of (young-sounding) business dudes talking, on the phone I guess. One suggests meeting for coffee to discuss business dude stuff. The other -- smug and secure in the cradle of his high-bandwidth ATT intertube service -- declines. "I have a great connection," he says (or words to that effect). "We can meet on-line." I admit it: I spend way too much time staring at my screens, both at work and at home. But I like to keep in mind (most of the time, anyway) the simple truth that digitally-mediated interaction ain't even a small fraction as rich, as satisfying, as informationally dense, or as socially weighty as your old, reliable F2F. Thanks to Thue via Wikimedia Commons for the image of a car wrecked in Copenhagen, Denmark; to Oldmaison (Charles Le Blanc) for the image of texting while walking (via Flickr); and John C. Abell for the image of @LenaGroeger and @Ericc29 @wired in at #nextwork (via Flickr). Robert Redford's latest, The Company You Keep, isn't a bad movie as thoughtful thrillers go. The film is a roman à clef about 60's and 70's radicals shedding long-standing, carefully guarded, underground identities to emerge (some unwillingly) into the harsh light of the late twentieth century. The characters are fictionalizations; their political origins in The Weather Underground are historical; and the brutal, fictionalized murder that vaults the film's Weather-alum protagonists onto the FBI's most wanted list is as brutal as the triple-murder committed by real-life alums of Weather in the course of an infamous 1981 Brinks robbery. 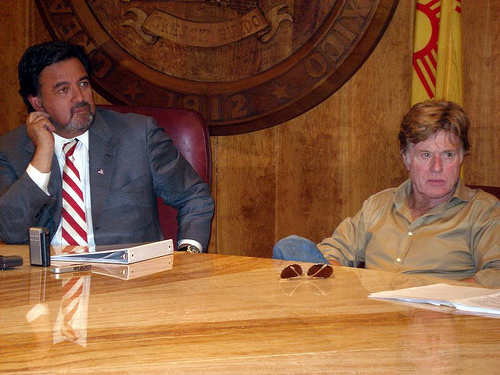 I kept an eye on the movie's development for several years, eager to see Redford's film version of a book I often use as a comp title when pitching my own novel, Consequence. So I saw the movie the weekend it opened in my neighborhood. The Company You Keep is still playing at the Albany Twin several weeks later, though the numbers at boxoffice.com suggest the project has had its big-screen ride, and it wasn't exactly a blockbuster. Robert Redford assembled a glittery cast for his latest directorial effort, The Company You Keep. The acclaimed star/producer also garnered his fair share of softball interviews with the likes of ABC's George Stephanopoulos. That wasn't enough to prevent the film from tanking at the box office. Could it have anything to do with the subject matter? A seam of melancholy runs through “The Company You Keep,” Robert Redford’s reflective melodrama about political idealism run amok and the wages of youthful folly. For audiences over 50, in particular, this fictional story of homegrown terrorists sprung from the 1960s counterculture should conjure complicated feelings of pride, shame, anger and regret. But along with those emotions, this earnest, well-intentioned movie elicits frustration that its story had to be packaged as a conventional, not very suspenseful fugitive thriller with a bogus Hollywood ending. Then there's the fact that Robert Redford, age seventy-six on the date of this post -- bless the man's stamina -- played a part conceived for a forty-something fitness nut, leaching the film of its thriller edge. I saw the movie with three others. All of us have worked and/or do work as political activists. Half of us had been politically engaged during the active period of SDS and Weather. The other half had read Gordon's novel. I was one of the latter; in fact, I'd already read the novel twice (then, after watching the movie, I read it again). All three of my fellow moviegoers came out of the Albany Twin saying that -- as fictionalizations go -- they liked Redford's take on the story. I couldn't get past my disappointment at how much of what really mattered about the novel was pared away to fit a fraction of its plot into a two hour film. Gordon's novel tackles what Breitbart's Troll Toto dismissed as "the subject matter" head on: why anybody -- and especially anybody who wasn't there, who didn't have skin in the social and political convulsions that marked the era of the Vietnam War and the Civil Rights Movement -- should or would look at The Weather Underground sympathetically twenty-five or thirty years later. 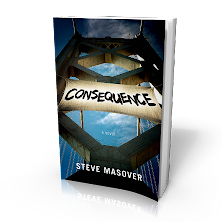 The novel is set in 2006 and tells a story set ten years earlier. In the book's 1996, protagonist Jim Grant is 'outed' as fugitive radical Jason Sinai, who has been living a false identity -- as a public interest lawyer -- for the last couple of decades, in upstate New York. Gordon constructs the story as a series of extended e-mails sent by participants on multiple sides of the splintering antiwar movement of the 1970's. Of course there are fictionalized members of Weather. There's a fictionalized FBI agent, who infiltrated the group's ranks on the campus of UM Ann Arbor shortly after returning from his own tour of duty in Vietnam. The FBI agent's daughter is a conservative student at Ann Arbor in 1996; her honors-thesis advisor is a professor who was himself in Weather with Jason Sinai. The audience for all these e-mailed angles about what happened during Weather's active period and over the years the protagonists spent underground is Grant's/Sinai's daughter Isabel. Sinai's daughter, of course, was born to a father living as someone he wasn't. In the novel -- which opens memorably with the line "All parents are bad parents" -- she is abandoned by that father as he sets out, with the FBI in full pursuit, to take his best shot at setting the historical record straight and saving Isabel from the girl's absentee, drug-addicted mother. The immediate goal of the e-mails, and the excuse for recounting -- to a generation for whom the 70's are ancient pre-history -- how and why Weather came to be, is part of a complex gambit to raise political support from actors in the highest levels of government, aimed at influencing a parole hearing for one of the novel's protagonists (this framing element of the novel's storyline was pretty much M.I.A. from the film). A skeptical young journalist with serious reservations about self-justifying leftists (and a serious anti-authoritarian streak of his own) is Jason Sinai's principal foil. There's a fair bit of wrangling between these two and others over bias that is or isn't inflecting the story being told to Isabel ... just like politics then and now. Historical background is tightly interwoven with accounts of fugitives on the run in 1996, of cops and journalists in hot pursuit, and of a burgeoning love story between the skeptical journalist and the conservative daughter of that fictionalized FBI agent. The accounts of their pasts given by Gordon's characters are coherent, self-critical, multivalent, and firmly grounded in the social and political agony in which the events they relate occurred. In other words, they are human. Neil Gordon's Jason Sinai loses his red-diaper-baby background (and is rechristened Nick Sloan), lopping off a crucial set of the protagonist's historical roots in the American left. The film pushes Jason's father-in-law into the deep background. In the novel, he's a powerful ex-Senator who learned the true identity of his daughter's beloved early in their relationship, but covered it up in order not to lose her to a fugitive life. The ex-Senator's string-pulling is the precipitating factor that manipulates the journalist character to expose Sinai in an effort to regain custody of his granddaughter. Most importantly, the depth and nuance of lived history -- political, social, and psychological -- brought to life in the novel's multiply-narrated tale-telling is all but fully bleached out of the movie in order to make way for ... well, for pretty much the same false alarms, close calls, and chases you saw in the last several dozen thrillers that crossed your eyeballs. And ... sorry, Mr. Redford ... a final flight through the thick woods of Michigan's Upper Peninsula -- rife with tension in the novel -- hovered between implausibility and anxiety that the septuagenarian star might have an unscripted heart attack before the chase was over. It's not that I have anything against Hollywood thrillers. It's just that there were fully-realized characters in Gordon's novel, and serious grappling with history, and passion, and compromise, and some pretty compelling reflections-in-hindsight. In the film these dimensions are reduced to single lines, fleeting scenes, and oblique references as the plot runs roughshod over character, motive, nuance, and backstory. Where a viewer doesn't fill in her own historical depth, the film barely ventures further than the shallow end of the pool. Yes, Redford's effort amounts to a credible thriller with some political gloss ... but it's not a tenth as engaging or as illuminating as the novel on which it was based. The film is good fun, and viewers of a certain age (who can and will fill in their own background) might find in it a certain nostalgic value. But do yourself a favor: read Neil Gordon's novel if you're looking for something more than an excuse to while away a couple of hours watching a better-than-average film. Thanks to Steve Terrell for the image of Redford with Gov. Bill Richardson, via Flickr by way of Wikimedia Commons.